Unlike previous years, where it was held on a Sunday, the 2016 edition was held on a Monday for the first time to take advantage of the U.S. Presidents' Day long weekend. The ceremony was televised in the United States by CBS; for the first time, CBS affiliates in the western half of the country had the option of broadcasting the Grammys live from the East coast feed, in addition to an encore in local primetime. 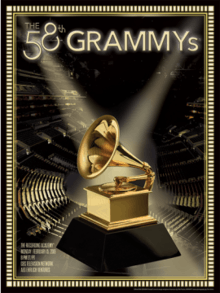 Nominations for the 58th Grammy Awards ceremony were announced on December 7, 2015. Kendrick Lamar received the most nominations with 11. For the latter, he went on to pass Eminem as the rapper with the most nominations in a single night, and second overall behind Michael Jackson (12 nominations in 1984). Taylor Swift and The Weeknd received seven nominations each. Producer Max Martin received the most nominations for a non-performing artist, with six. LL Cool J hosted for the fifth consecutive year. Gwen Stefani's "Make Me Like You" music video was acted out, filmed and broadcast live during a four-minute Grammys commercial break on CBS. Kendrick Lamar led the winners with five trophies, including Best Rap Album for To Pimp a Butterfly. Taylor Swift won three awards, including Album of the Year for 1989, becoming the only female artist to win Album of the Year twice as main credited artist. Alabama Shakes also won three including Best Alternative Music Album for Sound & Color. Ed Sheeran won two including Song of the Year for "Thinking Out Loud". Mark Ronson and Bruno Mars' "Uptown Funk" won for Record of the Year and Meghan Trainor won for Best New Artist. Rihanna was also slated to perform but was cancelled out due to her serious case of bronchitis. ↑ O'Connell, Michael (February 16, 2016). "TV Ratings: Grammys Hold Steady With Monday Move, Grab Nearly 25M Viewers". The Hollywood Reporter. Retrieved February 16, 2016. ↑ "The Recording Academy, CBS and Staples Center Announce The 58th Annual Grammy Awards® Will Air Live Monday, Feb. 15, 2016". GRAMMY.org. Retrieved February 5, 2016. ↑ Andreeva, Nellie (May 11, 2015). "CBS Shifts Grammy Awards To Monday For 2016". Deadline.com. Retrieved February 5, 2016. ↑ "West Coast CBS stations will air live Grammys". Los Angeles Times. Retrieved February 6, 2016. ↑ "LL Cool J to Host the 2016 Grammys". E! Online. Retrieved February 5, 2016. ↑ Lynch, Joe (February 10, 2016). "Gwen Stefani to Broadcast TV's First Live Music Video During Grammy Night". Billboard. Retrieved February 10, 2016. ↑ "Grammy Awards 2016: performances and winners – as it happened". Guardian. January 15, 2016. Retrieved February 16, 2016. ↑ "Adele, Kendrick Lamar Among First GRAMMY Performers". GRAMMY.com. January 20, 2016. Retrieved January 20, 2016. ↑ "Grammy Producer Ken Ehrlich Talks Kendrick Lamar's 'Provocative' Performance, Smacks Down 'All-White Tribute' Criticism". Billboard. February 15, 2016. Retrieved February 15, 2016. ↑ Jones, Jaleesa. "Kendrick Lamar brought special guests to the Grammys". USA Today. Retrieved February 17, 2016. ↑ "Lady Gaga Will Perform David Bowie Tribute at the Grammys". Billboard. Retrieved February 4, 2016. ↑ "Grammys: Justin Bieber, Chris Stapleton, Pitbull, Alice Cooper Added as Performers". The Hollywood Reporter. Retrieved February 3, 2016. ↑ "Alice Cooper Talks Hollywood Vampires' Grammys Gig, Lemmy Tribute". Rolling Stone. Retrieved February 4, 2016. ↑ "Rihanna Cancels 2016 Grammys Performance". Billboard. ↑ "All-Star Lineup of Celebrity Presenters Also Includes Current Nominees Cam and Ed Sheeran and Actors Kaley Cuoco And O'Shea Jackson Jr.". Grammys. February 11, 2016. Retrieved February 11, 2016. ↑ "Grammy Award winners – Aerosmith". NARAS (Grammy.com). Retrieved March 25, 2008. ↑ "Grammy - Spring 2016". Nxtbook.com. Retrieved 2016-07-24. ↑ THF Staff. "Grammys 2016: In Memoriam Tribute". The Hollywood Reporter. The Hollywood Reporter. Retrieved February 16, 2016.